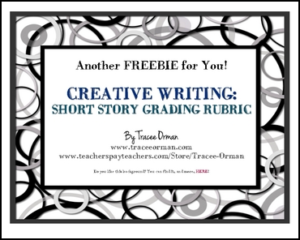 This two page document includes: one peer-editing rubric and one teacher grading rubric (the rubrics are the same, but labeled differently for each page). Includes the following categories: creativity, plot, development of characters, organization, spelling, grammar, and a Liked It/Didn’t Like It section. There is an explanation for every single point. I use this at the end of our short story unit when students compose their own. Students love to read their classmates’ stories, but are usually unsure on how to give valuable feedback on creative writing. This rubric helps.